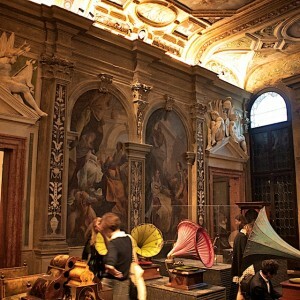 In an 18th century palazzo by the Rialto market along the Canal Grande the new show Art or Sound at the Prada Foundation is showcasing art works exploring music and sound. The exhibition is curated by long term Prada collaborator Germano Celant and will be open for the duration of the architecture biennale until November. The building itself is exquisitely detailed and is being completely restored. The second floor piano nobile is open to the public for the first time. In a space like this there is a theatrical aspect, where the exhibited works blend with the setting – a very different experience from the traditional clinical gallery space.